The Playhouse Theatre opened in 1907 and was built just a couple of years earlier. The theatre is quite small for a West End venue, with just 786 seats spread over three levels; the Stalls, Dress Circle and Upper Circle. Generally speaking, the best section of the theatre for viewing the show is in the centre of the Stalls, however these are also the most costly. Lower priced seats can be found in the Upper Circle which, as the theatre is of a smaller size, does not feel too high up. However there is limited legroom in the Upper Circle so it may not be ideal for very tall patrons. For in depth advice on which seats are best for which budgets, please see the price and seating guide below. Up to £35 None available None available Side seats in the Upper Circle are the cheapest seats in the house. Seats at the beginning and end of rows A-D and central section seats next to the stairs (Row B-J) are considered to be restricted view. These seats have either a sever side angle restriction or handrail restriction. Other than that, most of the side seats are fine for viewing the stage.Please note that legroom in the Upper Circle is fairly limited and it is not very suitable for taller patrons. £40- £45 A small number of £45 seats are available at the back of the Stalls. These seats are situated in row Q and may have a slightly restricted view due to the Dress Circle overhang. Side seats in the Dress Circle are at the top end of this price category (please see the Playhouse Theatre seat plan above.) These seats may have slight viewing restrictions due to their side angle to the stage. 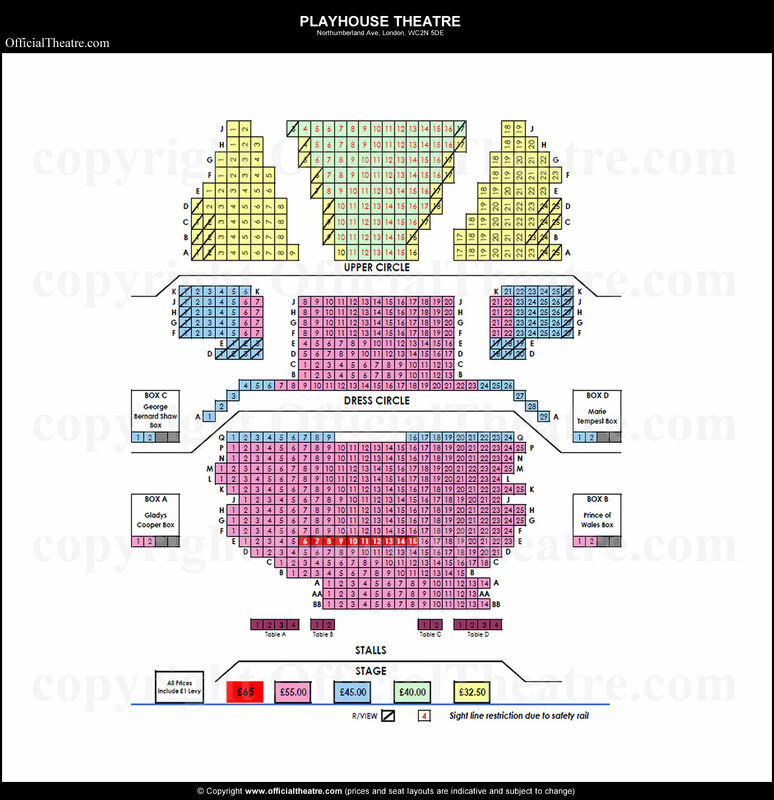 Seats at the lower end of the price category can be found in the central section of the Upper Circle. These seats will have a fair view of the stage but may have a slight obstruction due to the safety rail placement in front of row A.Please note that legroom in the Upper Circle is fairly limited and it is not very suitable for taller patrons.